Accurate Measure: Measures indoor temperature and humidity (℃/℉) accurately. Temperature detection range: -10℃-60℃, hygrometer detection range: 20%-95%. Max & Min Record: It can automatically record the Max and Min of temperature and humidity in 24 hours. You can change the way of temperature display by pressing"C/F" one time. 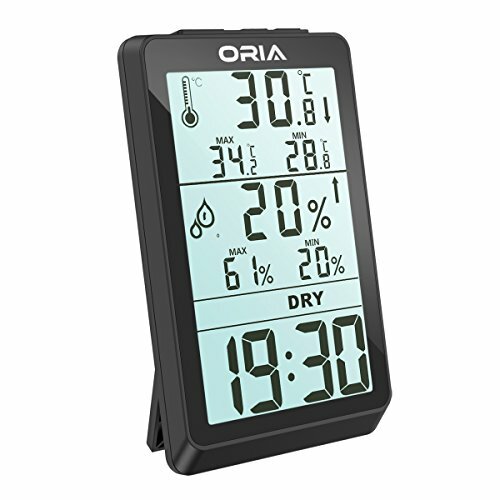 Clock Display: ORIA Digital Thermometer Hygrometer also have the clock display function, it can be used as clocks. Easy placement : Hanging on wall or standing upright on the table. It suits all your needs in baby room, home, nursery, hatchery cellar, basement, warehouse and so on. 1 Year Warranty: 12-month replacement warranty and 60-day money back guarantee.